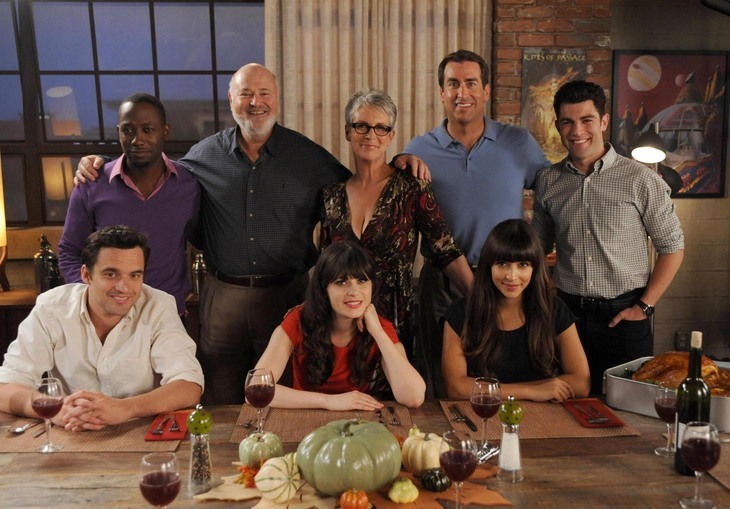 S02xE08 – Jess’s parents are coming for Thanksgiving. Jess has it in her head that she will perform the parent trap on her divorced parents, in hopes that it will work. Only problem is that she’s tried this before. Several times. And it’s never worked. Schmidt’s brother is also coming to dinner, and if you thought Schmidt thought very highly of himself, his brother trumps him several times over. Oh and Schmidt’s brother goes by Schmidt too. Very confusing. So to determine which brother can go by the name, they have a competition of strength and will power. Cece decides the ultimate manly test will be the first one to kiss Winston get’s to go by the name Schmidt. Meanwhile Jess’s tactics aren’t working so well, that is until both her parents go into the bathroom to cleanup her father’s clothes after a turkey baster accident, and when Jess opens the door, she finds her parents making out. Obviously this leads Jess to believe that her parents are getting back together, but when dinner finally happens, and they’re back to bickering, it’s a slap in the face for Jess who storms off dumping the entire turkey in the sink, and going to her bedroom. She’s twelve apparently. Jess’s mom goes in and talks to her and smooths things over making her realize that her parents are never going to get back together, it’s just not in the stars. Schmidt and brother Schmidt are trying to figure out if they can actually kiss Winston. Schmidt goes in for the kill, but chicken’s out, brother Schmidt does the same thing, and then just does it. Brother Schmidt wins, but Winston is disturbed. Best of the episode: Jamie Lee Curtis and Rob Reiner as Jess’s parents. Worst of the episode: Jess acting like a child because her parents aren’t in love. Where this episode leaves us: Schmidt and his brother are in constant competition, and the douche bag jar should be full.